The statue of George and the Dragon, Barras Bridge, Newcastle. Location: Barras Bridge, Newcastle. Materials: Bronze, Portland Stone and Granite. Sttus: Listed Grade II. Situated next to the West end of St. Thomas's Church at Barras Bridge. This statue has a central pedestal surmounting a curved ensemble of Portland Stone steps, terrace and benches. This is a First World War Memorial to the fallen of the 6th (Territorial) Battalion of Northumberland Fusiliers. There is also an added World War Two dedication to the 43rd and 49th Battalion Royal Tank Regiment. 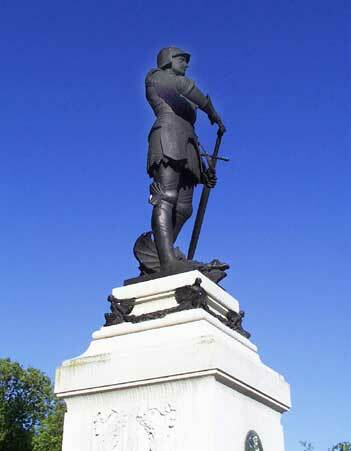 The life size bronze figure stands sheathing his sword over the severed head of the dragon while the pedestal below is decorated with an enamel on the same theme.